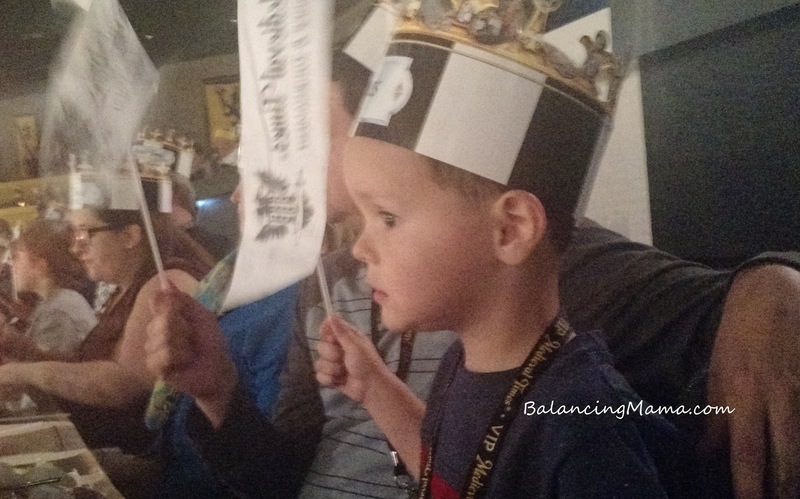 Kids and parents alike cheered and waved their banners non-stop throughout the show. 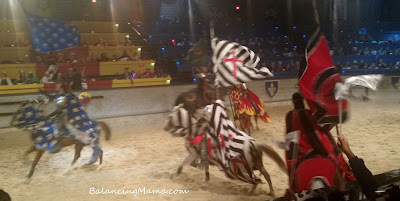 We were assigned a knight's section and introduced to our allied knights. We, of course, had to cheer on our own knight with as much volume as we could muster. We cheered well for the allies and we booed the others. The kids thought booing was a blast! This dining and show experience is like being at a rowdy sporting event - we all loved it. If I wasn't yelling, I must have been chewing my food. Dinner was served quickly by attentive hosts. The menu includes roasted chicken, corn on the cob, garlic bread, tomato bisque, and a seasoned baked potato. Both of my kids - ages 9 and 3 - ate the food! The little guy kept asking for a fork, but he got over it. 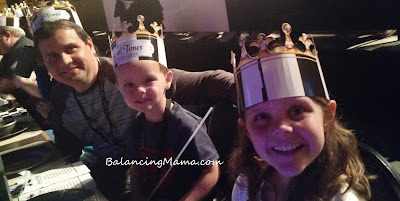 No utensils in this kingdom! The dessert offering varies night to night, but we were presented with a large slice of lemon pound cake during our visit. It was delicious! When the show ended, I purchased a couple small trinkets at the gift shop for the kids and a little something extra for my birthday girl. 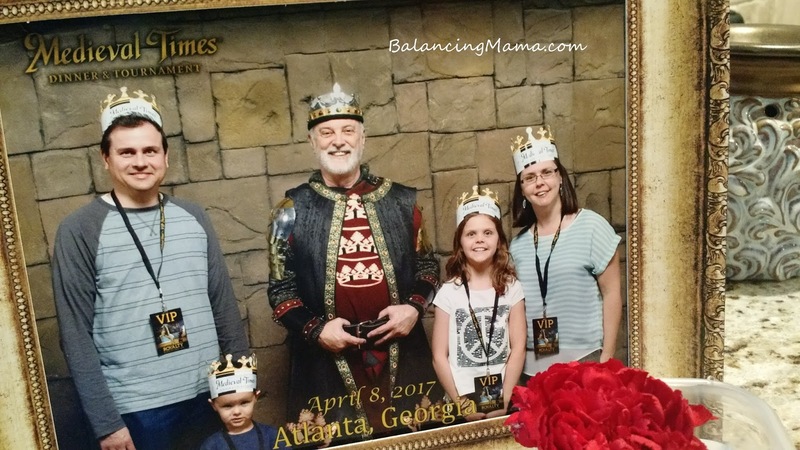 She felt like royalty from start to finish and we got to enjoy some quality family time together. 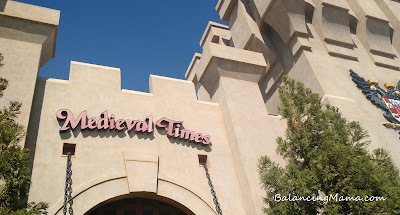 If you have an upcoming celebration on your calendar or if you just want to make some awesome memories with the family, check out Medieval Times. 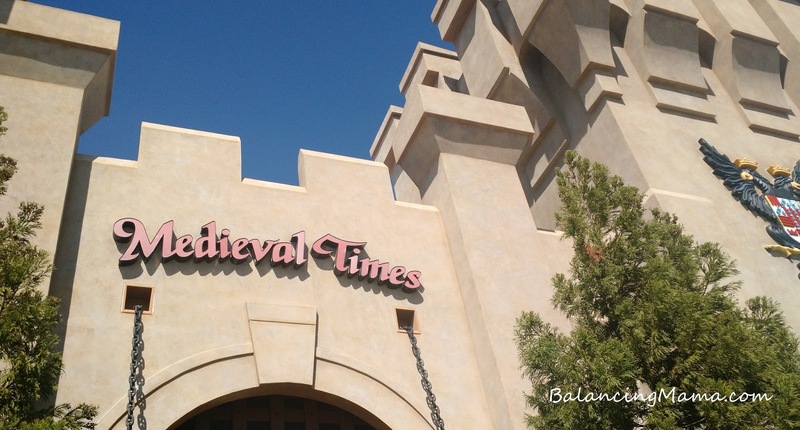 In addition to Atlanta, Medieval Times castle locations can be found Orlando, Myrtle Beach, Baltimore, Dallas, and more.